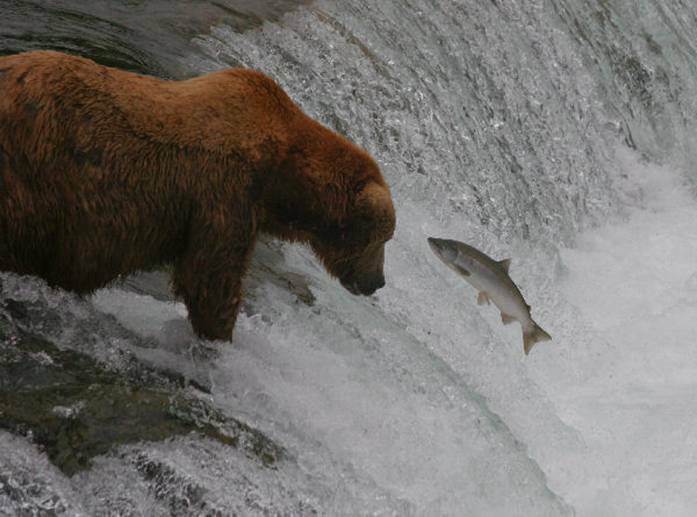 Waterfalls, Salmon, and Bears…oh my!!! Remember last week I mentioned that we had not seen any bears? Well, on Saturday we took a day trip out to Brooks Falls in the Katmai National Park to spend some time with the bears. 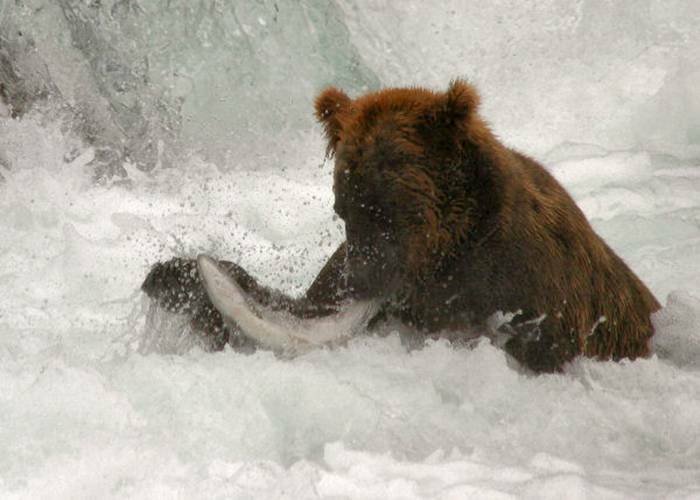 You’ve probably all seen pictures of bears catching salmon at a waterfall in Alaska…that’s Brooks Falls. When I made the reservation for the flight, I inquired about spending the night at Brooks Lodge, and the agent just laughed. You have to book rooms at least a year in advance. Anyway, our flight from Anchorage left at 7:45 AM and flew to the town of King Salmon, a little more than an hour away. At King Salmon, we transferred to a 10 passenger float plane for the 20 minute flight to Brooks Lodge. When the floatplane touches down on Naknek Lake your first instructions are that none of your luggage can touch the beach. You must immediately take your luggage to the gear cache or keep your day pack on your back and then head into the National Park Service Visitor Center, where you watch a bear-orientation video with instruction on how to handle a confrontation with a bear, and more importantly how to avoid one. 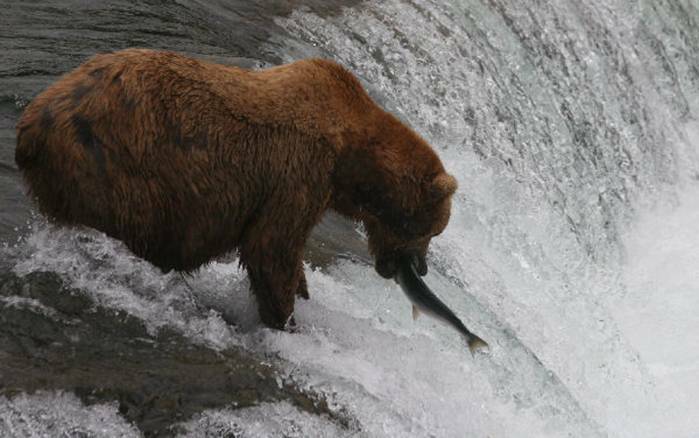 Katmai has the world’s largest population of protected brown bears; more than 2000 live within the park’s borders. So the odds are quite high that you might run into a grizzly as you are walking along the trails, just hope that you don’t accidentally come between a mama bear and her cubs. Visiting a park where bears have the right of way can be intimidating, but if you follow the rules of etiquette, peaceful coexistence is easily attained. 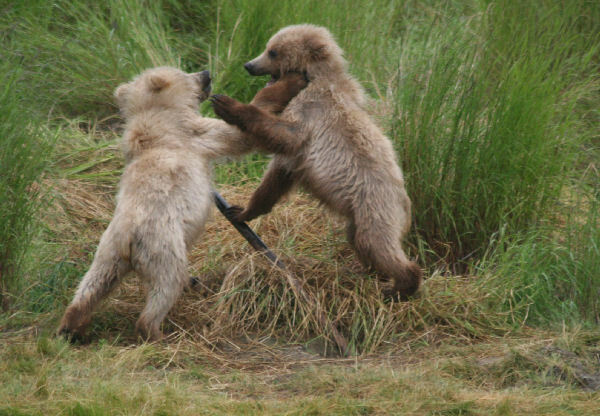 There are plenty of Park Rangers around to keep the people from interfering with the bears’ natural behavior. If a bear decides to take a stroll down the beach, or take a nap on the trail, no visitors can come within 50 yards, 100 yards if it is a mother with cubs. There is a footbridge across the Brooks River along the trail to the viewing platforms at Brooks Falls. If there is a bear within 50 yards of the bridge, the rangers close it until the bear decides to wander away. This often creates a “bear-jam”, which may last for several hours. In our experience, we were only delayed about twenty minutes on each of the two times we crossed the bridge. The delay was spent watching and taking pictures of the bears! Beyond the bridge there is a one mile trail through the woods to the viewing platforms at Brooks Falls. This trail, while well traveled, is not separated from the bears in any way. It is not unusual to see bears on this trail or in the woods around this trail. In fact, we did see a couple of bears about twenty yards off this trail as we were passing by…(just keep walking, don’t stop and stare at them!). 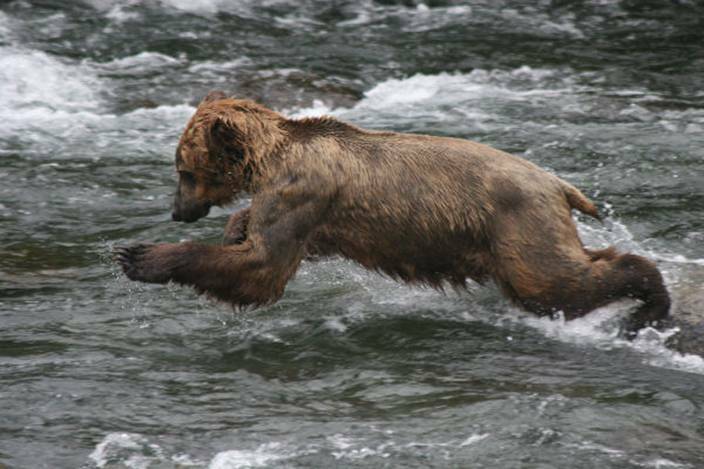 I have a whole sequence of this guy above…climbing up on the rock, making the leap, a big splash, and coming up with a tasty salmon! This one just hung out at the base of the falls and plucked up fish as they approached. 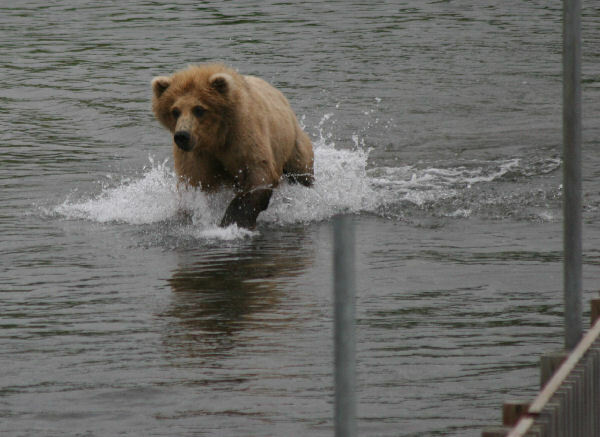 He’d catch one, wander off and eat it…then come back to the same spot and do it all again. We watched him catch and consume about six in the time we were at the falls viewing platform. While the trip cost almost a whole month’s Social Security check, it was worth it, and we’d do it again any time. Highly recommended! What adventure will be next??? ?